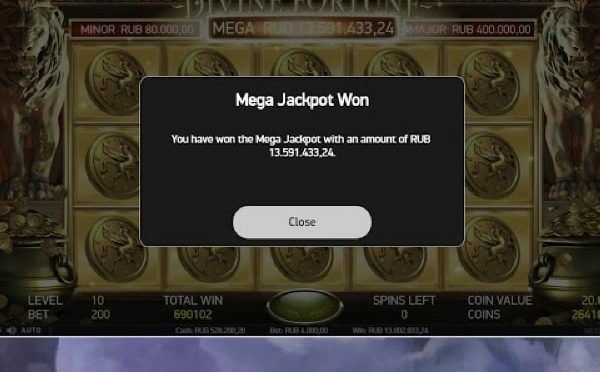 Today Russian casino streamer Vituss catch over $250 000 at Divine Fortune online slot. This is biggest win, catched by streamers from all world! So, Congrats Vituss! Huuuuge win! Venture back in time to the ancient Greek mythology in this Jackpot game from NetEnt. Experience mythical creatures, cascading gold coins, Falling Wilds Re-Spins, a Wild on Wild feature, and Free Spins. Get Lady Luck on your side for a chance to enter the Jackpot Bonus Game where three different jackpots await, and win the Divine Fortune! Land on three or more Bonus symbols to activate the Bonus game where all spins are free. This game starts off with three spins that will reset every time a new Bonus symbol lands on the reels, and these symbols will remain on the reels until the Bonus game is finished. If one row is filled with Bonus symbols the Minor Jackpot is won. If two rows are filled with Bonus symbols the major Jackpot is won. If all three rows are filled with Bonus symbols the Mega Progressive Jackpot is won. If you like the anticipation of possibly hitting a jackpot, you might also like Hall of Gods or Mega Fortune, two jackpot games from NetEnt that both offer three different jackpots each. $350 000 ? Really ?